Unless you're a great-great-grand nephew of Croesus, you might have encountered one tinny bit of detail that many travelers have faced since man learned how to sail: how to get enough dough to finance that dream jaunt. We could work desk jobs or blog or both to earn enough cash for a plane ticket and grub while traveling, or as an alternative, earn our tickets for free. One way to do this is by accumulating enough miles and points from credit cards or debit card companies that offer frequent flyer programs. Here in the Philippines there are several card companies and banks that offer such programs. 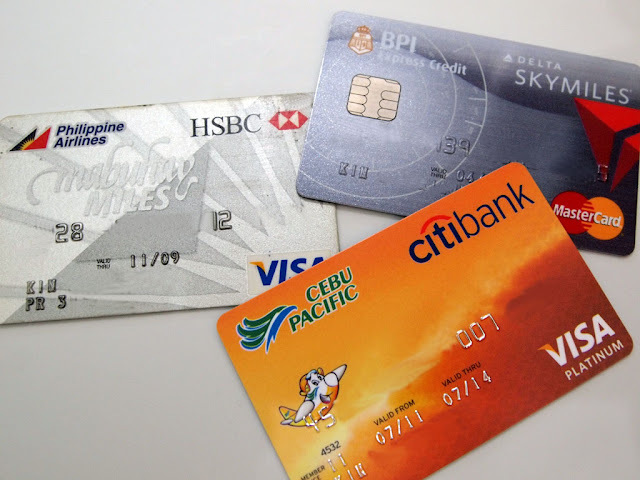 The ones I have tried are the HSBC Visa Mabuhay Miles, the Cebu Pacific Citibank Visa, and the BPI SkyMiles Mastercard. There are others more, the Allied Bank Mabuhay Miles comes to mind, as well as the Citibank Premier Miles, but I will restrict this post to the first three mentioned. In truth, the miles or points you earn from these cards are hardly free (unless you're financially disciplined and pay the whole balance before the cutoff dates) because you still pay interest on card balance. Interest payments aside, you will see that some cards are better than others too. The first frequent flyer card that I had was the HSBC Mabuhay Miles. You earn 1 mile for every PhP 45 spent, and the miles are redeemable as tickets for PAL domestic and international flights. The miles are accrued to your Mabuhay Miles account every 2000 miles you accumulate in your card. I later closed this card because I found the Mabuhay Miles program wanting. A one-way domestic flight would need around 4000-5000 miles one way, so it means that you may need to spend at least PhP 180,000 to get a one-way domestic flight. That is if you can get one at all. PAL does not offer redeemable flights frequently, and if they offer any, most have restrictions. The least desirable of all is that you need to redeem the ticket from their booking offices. If you have seen their booking office in Cubao, the sight of the long snaking line would make you swear off travel. Aside from that, the miles expire after 36 months. The next one I had was the BPI Delta SkyMiles card (this used to be the Northwest program but got renamed after Delta bought the former). Similar to the HSBC card, you earn 1 mile for every PhP 45 spend but the similarity ends there. The points you earned, no matter how much, are accrued to your Delta SkyMiles account at the end of every month. You can redeem the miles for tickets to international or US domestic flights (you will need around 25,000 for a US domestic one way, and around 140,000 miles for an international flight). Delta also offers the Pay with Miles option. You can pay part of your ticket using miles, with 5,000 miles equivalent to $50,and you can use as many by increments of 5,000. The miles do not expire. Using the conversion above, you may have to spend PhP 225,000 to get a $50 discount. The latest one I had was the Cebu Pacific-branded Citibank card (strangely, they classified this card as a Platinum card). This card do not earn miles, rather, it earns points. A PhP 100 spend will earn you 1 point, and 250 points can be redeemed for a 250-peso discount voucher, which you can use when purchasing tickets from the airline, without restrictions. So, you will have to spend PhP 25,000 to get a 250-peso discount on tickets. The points do not expire as well. One additional perk from this card is what I love the most: you will get a 2-hour advance notification via email and text message of Cebu Pacific seat sales. They also gave a one way ticket to any domestic or international (except to Caticlan, I think) when you sign up for a card. If you are using cards to pay for bills and when shopping for groceries and clothes, I would like to think that by earning miles or points at least you are getting something back from the banks, considering that they are gouging you with the monthly interest that you pay them. Choosing which one would really depend on your travel needs. When choosing one, also factor in the interest rate and other "hidden" costs, such as annual fees. With that, I think the only way to really travel for free is to be a stow-away. Mabuhay Miles today do not expire anymore. I will be getting soon a 2 round trip domestic PAL ticket through miles conversion from my Citibank Premiermiles Platinum Visa. This card offers P30 to one mile point. Also, I do pay my total amount due on or before due date, so it does save me from paying interest. I do not use my card because I want to earn miles. I take the mileage points as an intended, pre-planned bonus. I use the card because I need to. Then Citibank "surprises" me with reward miles for doing so. The annual fee is 2800 for the CebuPac Citi card. They gave me one more year of free annual fee last year, but I canceled the card this year. I think the Cash Back card is a better deal for me.